Liberal activist Brent Budowsky lambasted Hillary Clinton in an email to her campaign chairman John Podesta during the Democratic primary, saying that Clinton was lying about Sen. Bernie Sanders (I., Vt.) and a weak candidate with little chance of beating any Republican other than Donald Trump. Budowsky emailed Podesta on March 13, 2016, the New York Post reported Tuesday. The document was part of the latest WikiLeaks dump of Podesta’s emails, which came days after the U.S. accused Russia of hacking and releasing emails through sites like WikiLeaks to undermine the 2016 election. "Hillary should stop attacking Bernie, especially when she says things that are untrue, which candidly she often does," wrote Budowsky, a former aide to the late Texas Sen. Lloyd Bentsen. "Right now I am petrified that Hillary is almost totally dependent on Republicans nominating Trump," Budowsky added. "She has huge endemic political weaknesses that she would be wise to rectify … even a clown like Ted Cruz would be an even money bet to beat and this scares the hell of out me." The email was written during the the contentious Democratic primary between Clinton and Sanders. Budowsky also recommended that Clinton look for areas where she can adopt Sanders’ policies. It turns out, however, that Podesta is not a fan of Budowsky, as another email to top Clinton aide Cheryl Mills shows. "To you only: Brent Budowsky. 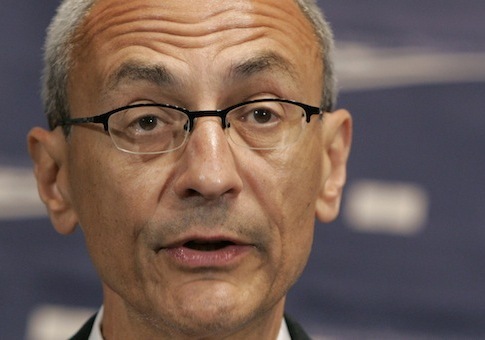 Leftie with no following …" Podesta wrote in January 2014. This entry was posted in Politics and tagged 2016 Election, Bernie Sanders, Democratic Party, Hillary Clinton, John Podesta. Bookmark the permalink.